"Cleopatra" is a DoubleDown Casino Classic. Released on-line in 2012, this Egyptian themed slot game has stood the test of time and remains in the "Popular" lobby to this day. Egyptian music, colourful symbols plus a humorous "Boing" on the Scatter makes this slot a must try for those who haven't headed down the Nile yet. The Queen herself greets you with varying phrases such as "I Wish You Great Prosperity" or "Share My Fantasy" and continues cheering you on during wins and bonus rounds. "Magnificent" she declares as your balance rises. She is quite the charmer! 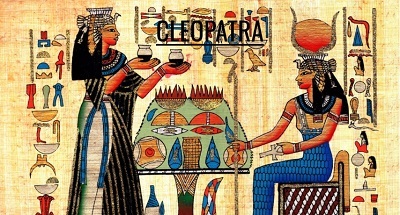 Elegant in its simplicity, Cleopatra is played on 20 paylines, offering 11 symbols, 1 Wild and a Scatter. Once again IGT knocked it out of the park with this instant favourite. One of the first slots to offer a bonus round that wasn't picked by the player, instantly winning 15 Free Spins with a 3x payout was a big draw. Now this may seem like a bit of a high school history lesson but some of these symbols need a little explaining! Let's start at the top of the paytable pyramid. Cleopatra, the intoxicating Queen of Egypt. Her death remains a mystery to this day, although some historians believe she died by a self-inflicted snake bite to avoid humiliation in Rome. Yikes! Cleopatra is the "Wild" and applies to every symbol but the Scatter. Winning combinations with one or more of the Queen doubles the payout and 5 of a kind will net you 10 000 x your stake. The "Scarab Beetle" is a treasured amulet to Egyptians as it represents the heavenly cycle of life. Made famous for its excellent dung ball rolling and found embalmed in many tombs, this symbol is next in value. 5 of these creatures wins 750 x your stake. The "Blue Lotus" which King Tut's mummy was embellished in, is tied with the dung slinger. 5 of this three blossom symbol wins 750 x your stake. The Golden Cartouche, which is the medallion shaped symbol containing hieroglyphics wins you 400 x your stake for five of a kind. The Shepard's Crook and Flail symbol representing kingship and fertility of the land will win you 250 x your stake as does the Eye of Ra symbol. The 9-King will net you 100 x your stake for five of a kind and 5 Aces nets 125 x your stake. Bonus Time. The Sphinx is one of the most recognizable statues in Egyptian history. The mythological creature with the Head of a King on the Body of a Lion is your Scatter Symbol. Two Scatters pays 2 x your stake which is a nice consolation for not landing the three needed to trigger the bonus. You can also re trigger the bonus with 3 or more scatters up to 180 free spins. All wins are tripled except for 5 Cleo's as she pays out exceptionally well on her own. Yes, there is a sequel folks. Cleopatra Plus offers a Level up feature that lets you enhance your game over time plus a few more bells and whistles. More on that later.